When was the last time you were doing laundry and thought to yourself, ‘it’s going to take a ton of energy to get my underwear clean’? While most people don’t think about how much electricity their appliances use, you should be aware of how much energy they are actually using. This is important as it can lead to your electricity bill being much higher than it should be. Although it doesn’t seem like most appliances will use that much electricity, you would be surprised how every appliance, no matter what size, will add-on to your bill. By taking a few minutes and figuring out which appliances uses the most energy in your home, you can simply use it less or even unplug it when you’re not using it. Every little change that you make will help you get your electrical bill to be less expensive. As difficult as it sounds, it is actually fairly simple, although time consuming, to calculate the amount of electricity your appliances use is actually pretty simple. To calculate how much electricity your appliances are using, you must first find the label that lists how many watts it uses. This can usually be found on the actual appliance and if not, then this information will definitely be in the user’s manual. The next thing you need is a rough estimate of how many hours per day you are using this appliance. Once you have these two numbers, you are ready to figure out how much electricity your appliances are using in just 4 simple steps. Step #1: Multiply the appliances wattage by how many hours per day it gets used. This will give you the total wattage used per day. Step #2: Next is to convert the daily watts to kilowatts. This is done by dividing the watts per day by 1,000. Step #3: Once you know how many kilowatts your appliance is using per day, you need to find out what that adds up to per month. To do this, multiply by 30. Step #4: It’s know time to figure out what this is costing you per month. Find your most recent electric bill and find how much that you are paying per kWh. Know multiply this number by the KWh per month number from above. Now keep in mind that these numbers were made up to show you the process and how it can be used to find out exactly how much each appliance is costing you per month in electricity. The only thing to keep in mind is that you are more than likely not using all your appliances the same amount of time every day. This means that your calculations are going to be off, unless you keep an extensive log of exactly how many hours per day appliances were being used. If sitting around tracking how often and how long all the appliances in your house are being used doesn’t sound like a fun Saturday night for you, there is a much easier way. This easier way is to use something called smart plugs. A smart plug is a plug that goes into an outlet between your appliance and the electrical outlet. Smart plugs are good because they can track how much power your appliance is using throughout the day. This is important, as there are several benefits of monitoring your appliances power usage. While it may sound like it is a bit ‘penny-pinching’ to monitor how much energy your appliances are using, there are actually several other benefits of monitoring your appliances power usage with smart plugs. For starters, smart plugs will help you become aware of how much energy that you are actually using. This is just good to know so you are able to make a conscious decision to help reduce your carbon footprint if you decide too. Another benefit of monitoring your appliances power usage with smart plugs, is that you can get a guestimate of how much you are going to be spending on energy. This can help you budget for that particular bill and if you wanted too, you can even set monthly or daily energy usage goals for yourself and your household. Besides knowing how much your electricity bill is going to be, knowing how much power your appliances are using may help you decide to not use those high-energy appliances as much. For example, instead of throwing your pajamas in the dryer every night before bed, you may decide to wait until you have a full load that needs to be put in instead. This will not only save you money, but it will prevent you from wasting an extensive amount of extra energy as well. Lastly, monitoring your appliances power usage with smart plugs can help you make energy-efficient changes to your home. Since you know how much you are spending on electricity, you can now take some positive steps to help reduce your power usage or add some sustainability to your home. This can be as simple as replacing regular light bulbs with LEDs, upgrading your washing machine and dryer to more energy efficient versions, or as extensive as understanding your power needs for a solar battery bank. 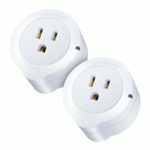 While the benefits listed above are the main benefits that you can utilize smart plugs for, they also have many features that can help you make your life much easier. 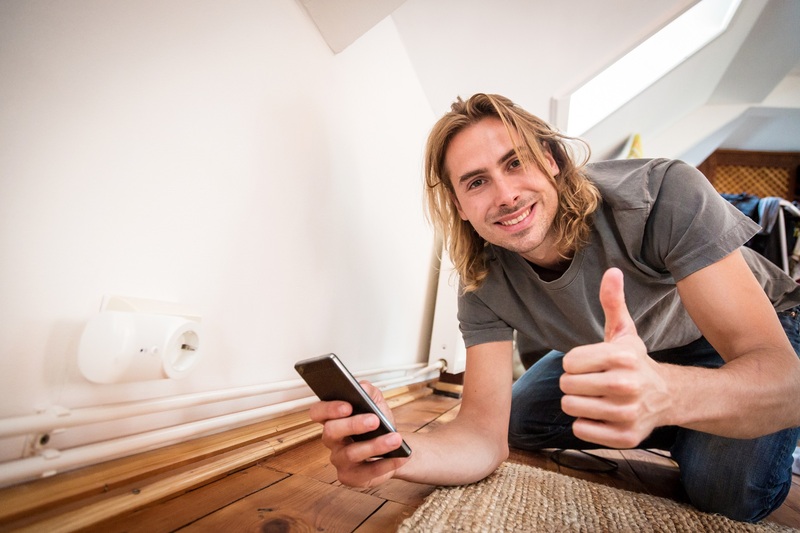 While smart plugs are an excellent way to measure power usage of appliances, they can also be used to make your life easier, as you can now get Wi-Fi smart plugs. This means that you will be able to directly connect to your computer or mobile device with the right app to track your power usage. And if that weren’t enough, you can even use the app to set timers for appliances and turn them on or off as well. This means that there is no more waiting for coffee to be made. You can set a timer to have the radio or television go on in the morning before you even wake up. Have your hair iron pre-heated so you don’t have to wait for it anymore. The possibilities of what you can control with a smart plug are endless. Other than helping make your day easier, smart plugs are also a great way to deter would-be robbers. If you know that you are going to be away from the house for a few hours or even a few days, weeks, etc., you can turn on lights from your phone or even set the smart plugs timer to go on at certain time. This will make it look like someone is at home, even when they are not. Probably the best benefit of smart plugs is that they can make you dinner. If you are going to make something in a crockpot or similar appliance, all you have to do is add the ingredients and turn on the crockpot when you want. This will ensure that you have a fresh, hot dinner waiting for you when you get home. Smart plugs are one of the easiest ways for you to monitor how much power your appliances are using. They do all of the calculations and keep track of the number of hours the appliance is used as well. Now combine that with all of the extra benefits that smart plugs are able to provide and you have a win-win situation. With smart plugs, leaving the light on, wasting all of the extra energy is now a thing of the past. With smart plugs, you will not only know exactly how much power you are using, but you will also have the ability to simplify your life as well. If you’ve read this far, you’re probably interested in taking the next step in measuring and monitoring the electricity usage of the appliances in your home. Here are a couple of products available for order on Amazon that can help you achieve that goal. The Etekcity Wi-Fi Smart Plug works with popular smart home hubs like Amazon Alexa Echo and Google Assistant. It allows you to not only monitor energy usage, but also control power to home appliances giving you control through your smart phone. 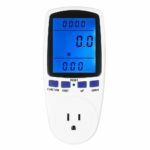 If you don’t need smart phone control or smart home hub connectivity, the Newforshop Electricity Usage Monitor is a lower-tech way of measuring electricity usage by an appliance. With its large LCD display, it can provide the metrics you need to make decisions about power usage and updating appliances. Do You Need a Whole House Battery Bank?